SAN FRANCISCO, CA--(Marketwire - Feb 3, 2012) - Unity Technologies, provider of the Unity multi-platform engine and development tools, today is thrilled to announce the winner of the celebratory Unity "Flash in a Flash" Creation Contest, which ran for just two weeks, timed with the public release of Unity 3.5 Open Beta and Flash Developer Preview on December 22, 2011. The fast-paced contest challenged developers to make their Unity-authored games come to life on the Adobe® Flash® platform. The contest was a runaway success with more than 500 games submitted by the deadline, proving just how fast games can be created, ported, and deployed to the Flash platform using Unity's development tools. After a tough evaluation, the judging panel reached a decision on the 10 best entries as well as the Unity "Flash in a Flash" $20,000 Grand Prize winner, Tail Drift, created by Cameron Owen. Tail Drift is a simple arcade racer challenging players to maneuver a red plane along a 3D candy-striped tubular track. 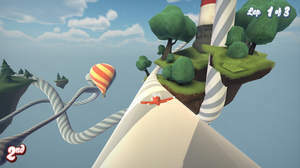 The track runs below, above, around, and through floating islands, hot-air balloons, and other obstacles for players to avoid in order to complete a clean run of the course and keep up with the AI competitors. Through stiff competition, Tail Drift was chosen for both creativity and fun along with its flawless deployment to Adobe Flash Player. After narrowing the field down to the 30 best titles, the decision became very difficult -- only ten titles could end up prize winners. "Not only is Tail Drift incredibly fun, but it also shows off both the amazing technology and fast development capabilities of Unity," said Lucas Meijer, Flash Development Lead, Unity Technologies. "It's extremely gratifying to see the development community adopt and take-off at such a rapid pace with the new beta, and we can't wait to see the stellar work that is still in store." Please visit http://unity3d.com/contest to find links to play Tail Drift and all of the runner-ups. "This was a thrilling contest for all of us at Unity," said David Helgason, CEO, Unity Technologies. "Our engineers have created some terrific technology for the Flash platform and it's truly inspiring to see so many developers adopt and create such amazing games so quickly." Unity 3.5 is currently in public beta. This release also provides a hands-on preview of Unity's upcoming Unity add-on for deployment to the Adobe Flash platform, enabling new publishing options to push interactive 3D content to the web. Since being made public in December, the Unity 3.5 beta with Flash Developer Preview has been used by nearly 50,000 developers. Download for the time-limited beta version of Unity 3.5 here: http://unity3d.com/unity/preview/. Unity is a trademark of Unity Technologies or its subsidiaries or affiliates. Adobe® and Flash® are either registered trademarks or trademarks of Adobe Systems Incorporated in the United States and/or other countries. Adobe is not sponsoring nor is in any way affiliated with the contest. All other brand names, product names or trademarks belong to their respective holders.